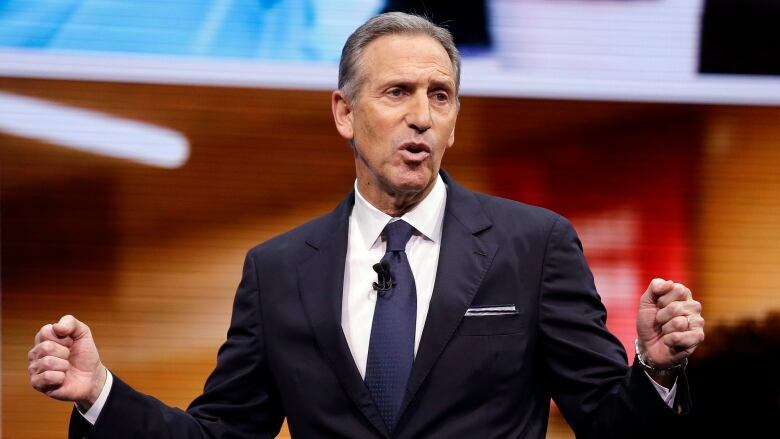 Former Starbucks CEO Howard Schultz said Sunday he was considering a bid for U.S. president as an Independent, upsetting some Democrats who believe he would hurt their party's chances of defeating Republican President Donald Trump in 2020. "I am seriously thinking of running for president. I will run as a centrist Independent," Schultz said in an interview with CBS's 60 Minutes. Schultz, describing himself as a "lifelong Democrat," said Americans were tired of the behaviour of both the Republican and Democratic parties. The Seattle billionaire, 65, launches a tour Monday to promote his latest book, From the Ground Up: A Journey to Reimagine the Promise of America. He has stops this week in New York, Tempe, Ariz., Seattle, Wash., and San Francisco — but no dates listed for the early voting states of Iowa or New Hampshire. "If Schultz entered the race as an independent, we would consider him a target… We would do everything we can to ensure that his candidacy is unsuccessful," said Patrick McHugh, executive director of the super PAC Priorities USA, which spent nearly $200 million in the 2016 presidential contest. Julian Castro, a former U.S. housing official who launched a bid for the Democratic nomination earlier this month, told CNN he was worried an Independent run by Schultz "would provide Donald Trump with his best hope of getting re-elected." While no independent has won the presidency since George Washington, Democrats fear that Schultz would almost certainly split their vote and give Trump an easier path to re-election. Yet Democrats concede that they had few tools to dissuade Schultz from launching an independent campaign — though many were skeptical that he would actually follow through. The liberal-leaning Schultz is known for being outspoken on issues ranging from gay marriage to government gridlock. He announced in June he was stepping away from the coffee chain he built into a global powerhouse, fuelling speculation about a possible presidential run. But his views might not mesh with the most progressive bloc of the party. While some potential nominees, including Massachusetts Sen. Elizabeth Warren and California Sen. Kamala Harris, have endorsed single-payer health care, heavily taxing the rich or free tuition at public colleges, Schultz has criticized some such proposals as unrealistic and instead emphasized expanding the economy and curbing entitlements to get the national debt under control. Asked why he was thinking about running as an Independent, Schultz said over 40 per cent of the U.S. electorate identifies as Independent. "We'll be fully resourced to do what is necessary" to run for president, he said. The Democratic National Committee declined to address Schultz directly. Spokesperson Xochitl Hinojosa offered only this response: "We are focused on defeating Donald Trump, and anyone who shares that goal should vote for the Democrat nominee in 2020."